A DAY IN THE LIFE.. KIRSTEEN CAMPBELL. 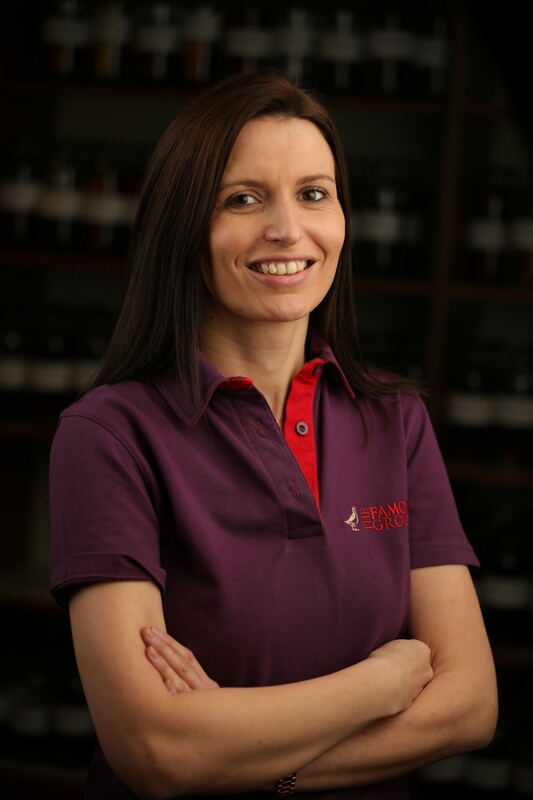 Kirsteen was appointed to the role of Master Blender for “The Famous Grouse”, and ” cutty sark” taking over from Master Blender Gordon Motion and is now in charge of blending “the famous grouse” which is sold in over 100 countries and is one of the biggest selling blends available. kirsteen graduated with a degree in Nutrition and Food Science, and started her career within the whisky industry where she was laboratory based within Diageo and then The Scotch Whisky Research Institute. Kirsteen then joined “The Edrington Group” in 2007 where “nosing” became second nature to her.. It is a privilege to have KIRSTEEN on board so I will hand you over to the lady herself.. Mornings are always a rush for me. I’m up at 6:30am. I’ll have a quick breakfast of tea and toast while listening to the news then I’m out the door. I’m not really a morning person! Thankfully my commute to work is only a short 15 minute drive. No two days at work are the same and that’s what I enjoy about my job. I became Cutty Sark Master Blender in 2010 then in 2015 I also took on the role of The Famous Grouse Master Blender. There are some tasks I must undertake daily such as nosing new make spirit and of course blending and bottling. Sensory Analyst, Max MacFarlane, who has worked with Edrington for over 40 years, oversees approval of Edrington’s cask samples and bottling vats but I pop in and out to see what’s happening. It’s a very busy sample room – as a team, we can be nosing up to 600 samples of whisky every day. Some days I’ll have meetings with whisky supply planners as we need to make sure we have enough blends in stock and can meet our bottling requirements. Our longer marrying period for The Famous Grouse means we have to plan further ahead than most. With The Famous Grouse, we’re bottling approximately enough to fill an Olympic-size swimming pool every month! I also have regular meetings with the brand teams which can cover a range of topics from new product developments to stock levels to training sessions and tastings I am taking part in. As Master Blender, I play a key role in the development of new products. I haven’t had the chance to work on creating a new expression for The Famous Grouse yet but I hope to do this in the future. I’m also involved in secret projects and innovations (which I’ll admit sounds exciting and mysterious) and this involves going to sessions with a wide panel of people from throughout Edrington. Another key part of being Master Blender is my brand education role which sees me going out to deliver tastings and blending masterclasses. Recently I ran a ‘live chat’ on The Famous Grouse YouTube and Facebook channels which gave customers in different countries the chance to ask me questions. This was a first for me and it was fun to be involved in. The Famous Grouse is sold in over 100 different countries so one of the perks of my job is I get the chance to travel. I love doing this as I get to meet customers in different markets and discover how they are connecting with the whisky. Our fans are a loyal bunch. I recently met one of our oldest; his name is Jack Reynolds. He’d just turned 104 and he still enjoys a dram of The Famous Grouse every day! At about 4pm I’ll stop and catch up on emails while having my first coffee of the day. This might sound late but I can only have coffee once I’ve made sure no more sensory work is required that day. I leave work at about 5:30pm but my iPhone means my email catch up usually extends into the evening when I’m back at home. I’ll also go on social media to keep up to date with our brands’ followers and share any exciting news. Despite my day sounding long and extremely busy, I do genuinely love my job and I’m immensely proud to work with The Famous Grouse and Cutty Sark. I would like to thank Kirsteen for her time and great work she does within the industry.. I think you will all agree this was another great insight into another position inside the industry..
Next Post AN EXTRAORDINARY EVENING WITH GORDON AND MACPHAIL. A nice read for me, I look forward to read more on this topics from you. I like drink the Blend Whisky. A very interesting read, will be happy to read the rest of the series now. A very interesting read and a great series. Yet another great article from you. Sounds like a job for me, where do I sign up. I do like this series you are running so keep up the great work and lets hope there will be many more to come. It takes a very special person to hold a role like KIRSTEEN does, I am not sure my nose would be good enough to do this job. Kirsteen is a great person who is full of great knowledge and passion, great to see you have her on board. Fantastic write up keep up the good work. Another great piece from a very important person within the industry. Great series mate ! That they do George.. and when you look at the industry the ladies are starting to dominate some of the most important jobs so it shows how the industry is evolving.. Very interesting piece. For so many years it was man the master blender, and man the “enjoyer” of blenders work. Women in the industry show how alive, how flexible it is. Not only on “production” part of it, but as well on our, customer end, women play important role.